Weldcut.pl Shop is an online store, leading retail and wholesale products from welding, power tools, abrasives via the Internet. On the pages of the store weldcut.pl are given information that does not constitute an offer within the meaning of the Civil Code. Product data, descriptions and prices are only commercial information. An order placed on weldcut.pl be construed as an offer to buy a particular product, the conditions given in the specification of the product. Orders in the shop weldcut.pl can be placed 24 hours a day. The prices of all products displayed on pages www.weldcut.pl are gross prices (including VAT), are expressed in Polish zloty or Euro and do not include shipping costs that are given separately. Execution of orders is made only on weekdays to 16.00. Orders placed later on Saturdays and Sundays and holidays, are executed the next working day. Seller agrees to protect personal data in accordance with the Act of August 29, 1997. Seller reserves the right to cancel promotional campaigns at the store, to introduce new products to the store by changes in the prices of products and services on offer, and to carry out changes. The price of each is valid at the time of order. In justified cases, we reserve the right to change prices of goods on offer, the Client will be informed immediately. If the new price does not meet the client's expectations, he has every right to change or cancel the order. Seller agrees to make every effort to ensure that products available on the website of the store coincided with the actual inventory of the Seller. In the event that your order will not be completed, the seller is obliged to immediately notify the Buyer and refund the payment received amount of money if the Buyer has paid. Used name: Hypertherm, CEBORA, Ajan, Trafimet, Lincoln Electric, Thermal Dynamics, SAF is the property of those legal firms. None of the products offered is not a product of the original manufacturer. Reference numbers for genuine products above. Companies are invoked for the convenience of the buyer and refers to the specified code and description of parts. Weldcut is not an authorized distributor of Hypertherm, Inc. and is in no way affiliated with Hypertherm. References to the above‐named machines, torches, consumables, and part numbers are for convenience only. Weldcut products are manufactured by or for Wedcut. Parts indicated as “OEM” are original Hypertherm parts manufactured by Hypertherm and are being resold by Weldcut. The buyer is obliged to provide valid and complete personal information, ie. Name, address, telephone number, e-mail. 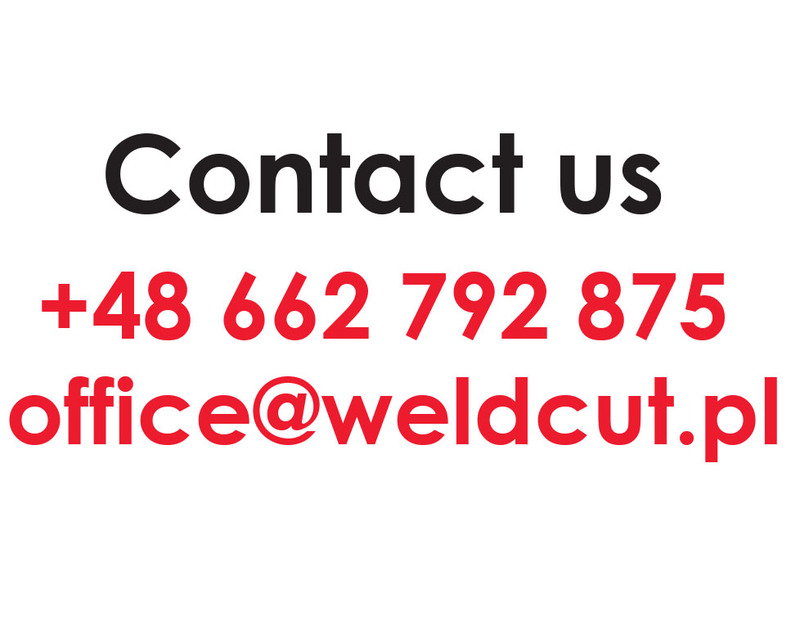 Changes to the order can be entered or the order may be withdrawn if the customer will contact the Seller by e-mail by writing to: biuro@weldcut.pl or by calling +48 662 792 875. Changes have already submitted orders are considered only until 14:00 on weekdays. After 14:00 we are not guaranteed to make changes in the conditions of the order. There is also a possibility of using PayPal account or credit card payment MasterCard / Visa. Execution of orders is made only in the days 15.00. Orders placed later or Saturdays and Sundays and holidays, are executed the next working day. Cooperating with an online shop providing courier delivery the next day after shipment. Deliveries are made mainly to 17.00. Courier is obliged to make three attempts to deliver the shipment. Delivery attempt are taken day after day on weekdays. Seller agrees to clarify the possible delay in the execution of orders and delivery of shipments. The customer is informed about the payment is recorded as well as shipping by mail. Seller agrees to postage up to 5 business days of receipt of payment. Shipments are sent exclusively via courier. General conditions for the provision of courier services provided by the company, which works online store weldcut.pl are available on the carrier's website. Complaints of products are handled in accordance with the Law of 23.04.1964r. Civil Code. weldcut.pl responsible for the inconsistency of consumer goods with the contract only if its findings before the expiry of two years from the date of the goods to the Buyer. After considering the complaint is justified, the Seller undertakes to repair or replace the purchased goods to another full blown. When stocks are exhausted Seller agrees to pay transaction costs or offer other product available in the online store. Requests complaint filed in store weldcut.pl will be dealt with within 14 days. Return of goods is recognized only when the goods have not been used, it is not damaged in any way and is in an intact original packaging. According to the Act of 30 May 2014. On consumer rights (Dz. U. of 2014. Pos. 827) Buyer who is a consumer within the meaning of art. 221 of the Civil Code has the right to cancel the contract of sale without giving reasons, within 14 calendar days from the date of delivery of the goods. The purpose of the deadline is enough to send a statement before the deadline. According to the Act of 30 May 2014. On consumer rights (Dz. U. of 2014. Pos. 827) Buyer who is a consumer within the meaning of art. 221 of the Civil Code has the right to withdraw from the contract for the provision of electronic services without giving reasons, within 14 calendar days from the date of the agreement. The purpose of the deadline is enough to send a statement before the deadline. Seller without delay sends the consumer a confirmation of receiving a declaration of intent to withdraw from the sales agreement provided by the consumer e-mail. In the case of use by the consumer of the right of withdrawal, the consumer is obliged to return the goods to the Seller immediately, ie. Not later than within a period not longer than 14 days to the address of the shop. The consumer may also return it by passing it to the receiving person authorized by the Seller, while keeping w / the deadlines. To meet the deadline just reference things before its expiry. The consumer bears the direct cost of returning the goods (shipping) thereof. The seller, not later than 14 days from the date of receipt of the declaration of the consumer to withdraw from the contract, return to the consumer all payments made by him, including the cost of sending things. Packaging and shipping method returned goods should comply with the characteristics of the product, and be suitable for safe transport, no breach of the physical characteristics of the product. Additionally, the product should be properly packed and secured so that the original packaging has not been tampered with. Box, please wrap in paper or foil. Buyer agrees to pay the cost of returning the goods with reimbursement. By placing an order the Customer agrees to put his personal data into the database WELDCUT Luke Mielcarz based in Siedlce. The customer has the right to inspect their personal data and their amendments, as well as to remove from the database. Personal data are used by the Seller solely for orders and subject to the consent of the client - in inches promotion. In matters not regulated by these Regulations shall apply the existing legislation. Nothing in the regulations is not intended to affect the rights of the consumer. There can also be interpreted in this way, because at the time of non-compliance with any part of the regulations applicable law Vendor declares unconditional surrender to and application of this law in place of the challenged provision.